Regional brain blood flow increases up to moderate intensity exercise. At higher exercise intensities, blood flow velocity in the middle cerebral artery levels off (at around 50-60% of maximal exercise) and then decreases during heavy exercise. This blood flow pattern has also been observed in the internal carotid artery. Potential mechanisms underlying such a response include a reduction in partial pressure of arterial carbon dioxide (PaCO2) induced by hyperventilation or high exercise-induced sympathetic nerve activation. 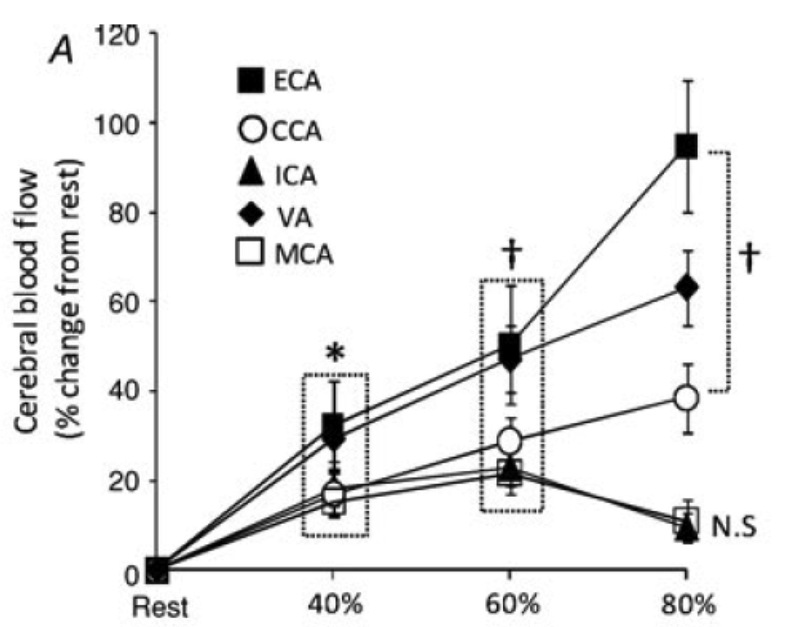 Interestingly, vertebral artery blood flow and common carotid artery blood flow increase from rest to heavy exercise. In a study recently published in the Journal of Physiology, Sato et al. examined the relative contribution of different cerebral arteries (common carotid artery, internal carotid artery, external carotid artery, vertebral artery and middle cerebral artery) providing blood flow to the brain and head during two incremental cycle exercises (the incremental exercise protocol needed to be performed twice in order to have the complete picture due to insufficient space at the level of the neck and interference between Doppler beams from multiple probes) in healthy subject. The figure below shows blood flow responses in each artery at different exercise intensities. As in several other studies, these authors observed transient elevations in blood flow velocity in the middle cerebral artery and blood flow in the internal carotid artery from rest to 60% of maximal exercise followed by a reduction in blood flow at 80% of maximal exercise. However, blood flow in the common carotid artery, external carotid artery and vertebral artery increased from rest to heavy exercise. Interestingly, the elevation in external carotid artery blood flow from moderate- to high-intensity exercise was negatively correlated with the decrease in internal carotid artery blood flow. The latter suggests that a large elevation in external carotid artery blood flow may contribute to the decrease in internal carotid artery blood flow observed during heavy exercise. In other words, although we already know that PaCO2 is a primary contributor in the regulation of brain blood flow during exercise, this study suggests that the distribution of carotid blood flow could limit the elevation in internal carotid blood flow during heavy aerobic exercise. Should we increase mean arterial pressure, no matter what the means, to secure brain oxygenation during anesthesia? Following the publication of our studies on the influence of vasopressors on cerebral blood flow/oxygenation, Meng et al. published their study supporting our data. The aims of this study were to evaluate the impact of administrating bolus injection of phenylephrine and ephedrine on frontal lobe oxygenation in anesthetized patients undergoing elective surgery and to identify the variables that are responsible for the changes in frontal oxygenation induced by phenylephrine and ephedrine. Initially, thirty-three patients were enrolled in this study. Of these 33 patients, they authors were able to administer the drugs and complete all measurements in 29 patients. Phenylephrine or ephedrine was administered as soon as patients were experiencing anesthesia-related hypotension, defined as at least a 20% reduction in mean arterial pressure or mean arterial pressure below 60 mmHg). Of note, bolus injections were administered and measurements were performed before the beginning of surgery. Frontal lobe oxygenation (near-infrared spectroscopy), cardiac output (oesophageal Doppler). 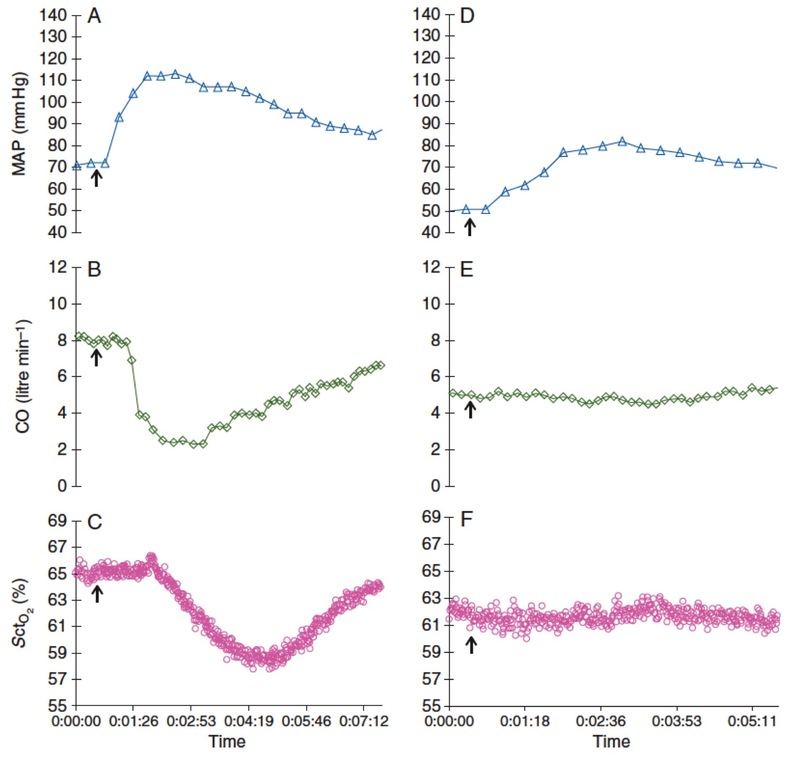 mean arterial pressure (intra-arterial catheter system), end-tidal carbon dioxide (gas analyzer built in the anesthesia machine) and depth of anesthesia (BIS monitor) were recorded before each bolus injection, at the maximal impact of the drugs and at the lowest frontal lobe oxygenation monitored following the maximal impact of the drugs. The 2 figures below present mean and individual changes in mean arterial pressure, cardiac output and frontal lobe oxygenation with both agents. 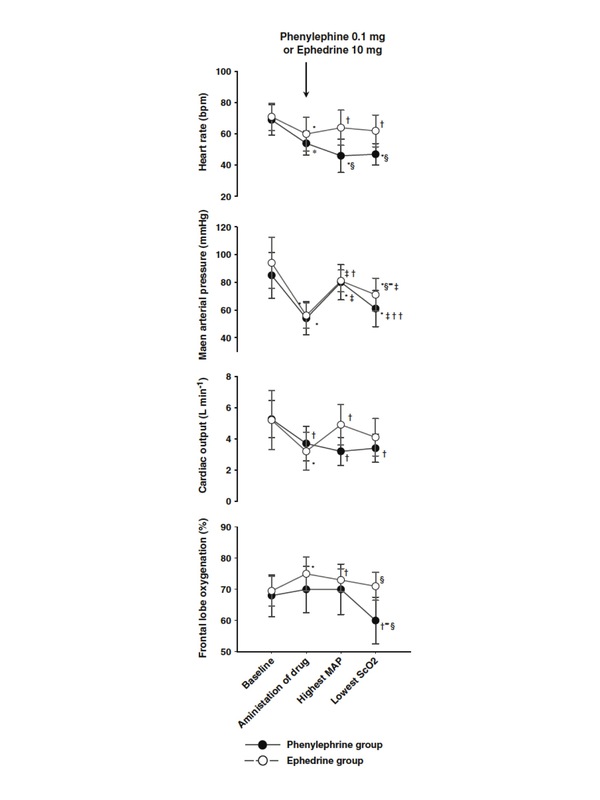 The administration of phenylephrine (A, B, C in both figures) was efficient at increasing mean arterial pressure, but was associated with a reduction cardiac output and frontal lobe oxygenation. The administration of ephedrine (D, E, F in both figures) was also efficient at increasing mean arterial pressure. However, cardiac output and frontal lobe oxygenation remained unchanged. Interestingly, cardiac output was identified as the variable associated most significantly with frontal lobe oxygenation. 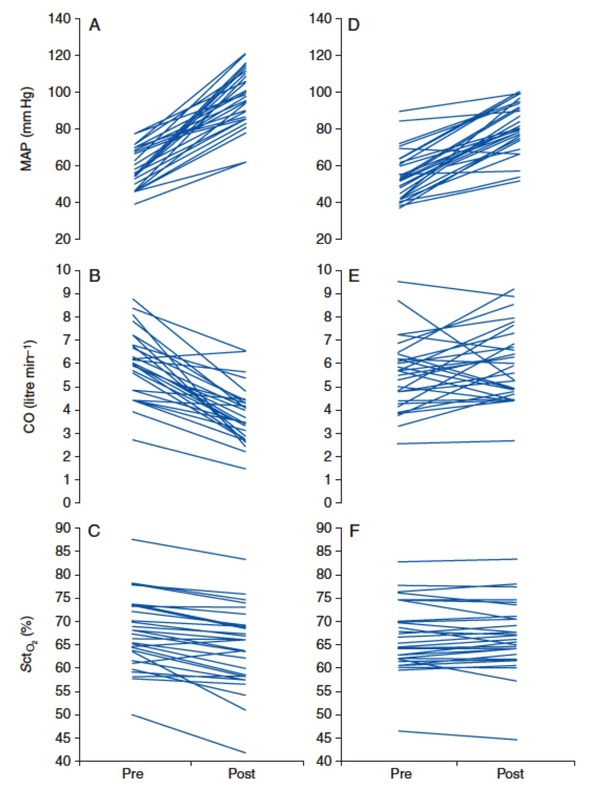 This study supports the existing link between changes in cardiac output and cerebral oxygenation reported in different circumstances and study designs. The potential mechanisms underlying the modulation of cerebral oxygenation by cardiac output could be sympathetically mediated vasoconstriction induced by a lowering in cardiac output or it could also depend on the distribution of circulating blood volume. If treating hypotension is an attempt to avoid organ ischaemia and hypoxia, we are actually achieving the opposite result (decreased cerebral oxygenation) by administering phenylephrine, as demonstrated in this study a quantitative NIRS device and in pressure studies using a trend NIRS device. Thus, the routine and indiscriminate use of vasopressors might be less beneficial than previously thought. Phenylephrine represents a first-line agent used to maintain mean arterial pressure in hypotensive states because of minimal impact on heart rate. Conversely, ephedrine is not considered a first-line agent, especially when the elevation in heart rate is undesirable. Further research is needed to better understand if these acute changes in frontal lobe oxygenation following administration of phenylephrine are associated with adverse post-surgical outcomes and if administration of ephedrine (rather than phenylephrine) is related to better post-surgical outcomes. I did not have the occasion to blog about my own research to date. Well, let’s do it ! This post will also serve as background information for future discussion. During my postdoc, I had the possibility of studying cerebrovascular physiology. My lab was interested in cerebral blood flow and metabolism in humans. When I arrived in Copenhagen, the Journal of Applied Physiology’s Point:Counterpoint: Sympathetic activity does/does not influence cerebral blood flow was “in press”. I found that issue really fascinating… I did not know: A) that I was about to be involved in that debate, and B) that story would form the background for my first grant proposal to CIHR and my first research scholar application to FRSQ ! Let’s take a look at the main results of 3 studies conducted during my postdoc. But first, some background. In clinical situations such as during general anesthesia, a reduction in arterial pressure, e.g. hypotension, may appear following a reduction in cardiac output, peripheral vascular resistance, or both. Evidence suggests that under a mean arterial pressure of ~60 mmHg, autoregulation in the cerebral vascular beds is impaired. As a consequence, blood flow in the brain becomes pressure passive and it will decrease with a further lowering in arterial pressure. Since the presence of arterial hypotension has the potential to challenge the perfusion of vital organs such as the brain, it is clinically relevant to restore arterial pressure within the range of autoregulation in order to secure cerebral perfusion pressure. However, the means by which arterial pressure increases is important. For example, if peripheral vasoconstriction is the mean by which arterial pressure is increased, this approach will not be necessarily associated with a parallel increase in blood flow to vital organs such as the brain (arterial pressure does not always represent efficient blood flow, which is the variable that needs to be influenced in order to restore systemic oxygen delivery and improve tissue oxygenation). Depending on their specific target, some vasopressor agents will exclusively influence vascular resistance (such as phenylephrine), others will have a predominant influence on vascular resistance with a minor chronotropic and/or inotropic influence on the heart (such as norepinephrine) while others will have chronotropic and/or inotropic properties (such as ephedrine). Although mean arterial pressure increased to a similar extent with both phenylephrine and ephedrine (see administration of drug vs. high MAP), we observed a 14% reduction in frontal lobe oxygenation following the administration of phenylephrine. On the other hand, frontal lobe oxygenation was maintained following the administration of ephedrine. 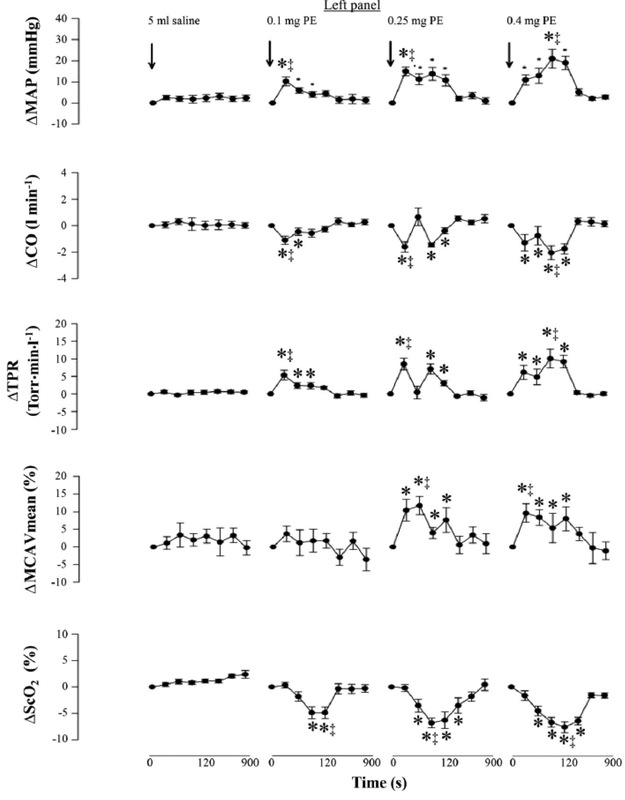 These results suggest that while vasopressors are administered to increase or maintain cerebral blood flow and oxygenation, drugs which increase arterial pressure via total peripheral vasoconstriction may lead to a reduction in cerebral oxygenation. In addition, cardiac output may be an important variable to manipulate to increase arterial pressure as frontal lobe oxygenation seemed to be maintained following administration of ephedrine. A recent study presents interesting results in that sense and I will discuss that study in an upcoming post. We observed that although the infusion of norepinephrine increased mean arterial pressure by peripheral vasoconstriction in a dose-response manner, it negatively affected cerebral oxygenation, characterized by a reduction in both frontal lobe oxygenation and internal jugular venous oxygen saturation. Another study performed in similar healthy subjects (3) was undertaken with the utilization of phenylephrine to support our initial clinical observations. 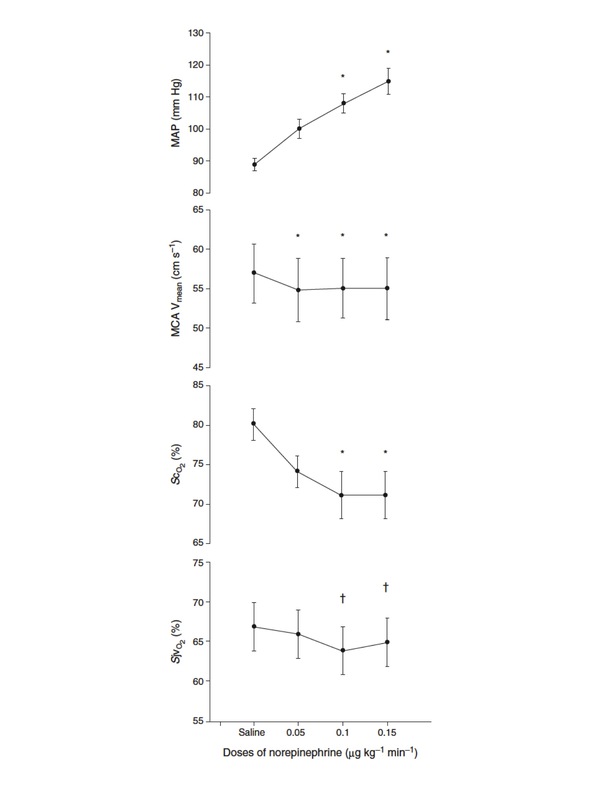 Subjects received an intravenous bolus injection of saline and three 5-ml doses of phenylephrine (0.1, 0.25, and 0.4 mg) separated by 20 min, and the variables described for the norepinephrine study (see Figure above) were monitored for 15 min. Mean arterial pressure increased ~20% with augmenting doses of phenylephrine while cardiac output (CO) was reduced. Then, following the maximal impact of the drug, frontal lobe oxygenation (ScO2) was decreased by 7% . Thus, the elevation in arterial pressure by an augmentation in total peripheral vasoconstriction is associated with a reduction in cerebral oxygenation in healthy subjects and patients undergoing elective surgery. This could partly be explained by a lowered cardiac output. Further research is needed to support these results that could eventually influence actions in the operating room. Of course, there are some limitations to these results. I will address some limitations related to transcranial doppler and near-infrared spectroscopy in another post. Finally, several exciting studies related to that issue have recently been published and I will discuss the results of these studies pretty soon ! Dear readers, exciting blogging projects (in English and in French) are in preparation. Although Le Physiologiste is here to stay, I am taking advantage of all these new projects to stop for a minute and think about what I would like to share over here in the future. I have to admit that I would really like to focus even more on cerebrovascular physiology since it represents my main research interest. However, is it something you are interested in ? Would you like to read more about exercise physiology ? Do you enjoy reading about my professional life as a new university professor/researcher? In other words, I need your feedback! Next time you visit Le Physiologiste and that you read this post, tell me who you are (student, postdoc, professor, etc. ), what are your research interests and what you like about the blog.